HandKrafted by Stephanie: Taylored Expressions March Release Day!!! 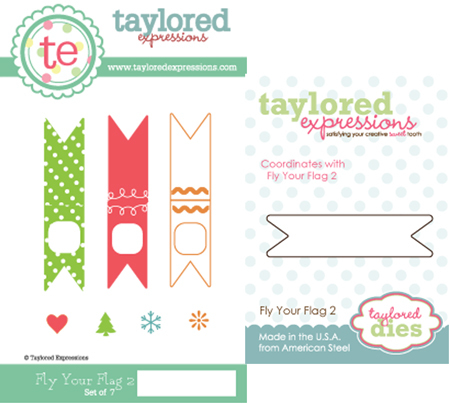 Taylored Expressions March Release Day!!! Hello and Welcome to Taylored Expressions March Release Day! More projects from the Baker's Dozen to inspire you. Please follow the link list below. 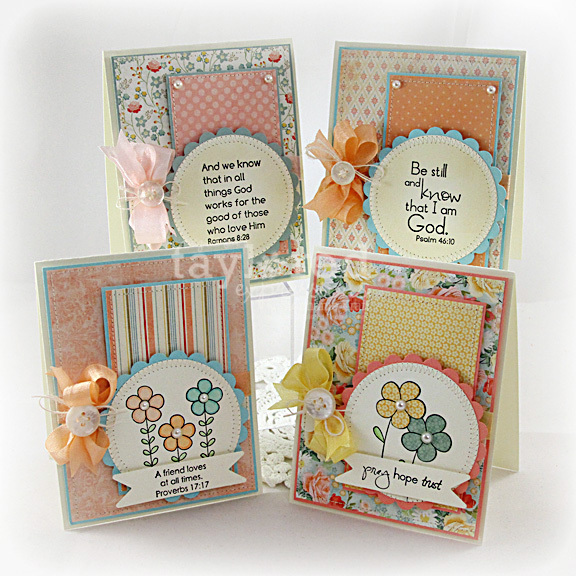 Today, I have a set of cards featuring Faith in Bloom, a new full sized set which was illustrated by Emily Burger and is part of her Embracing Grace line. 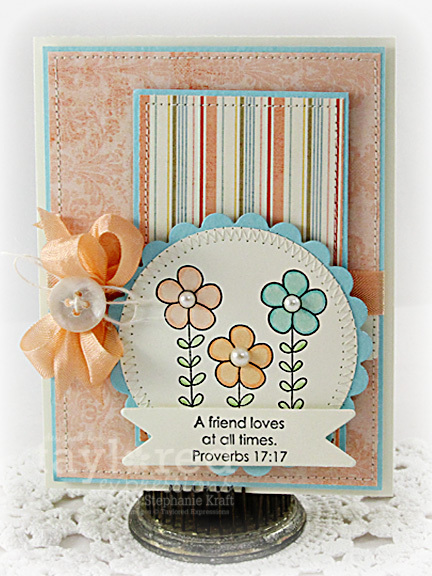 Emily has lent her unique, fun style to these Bible verses and words of encouragement and combined them with some whimsical flowers. I absolutely ADORE this set and couldn't get enough of it! 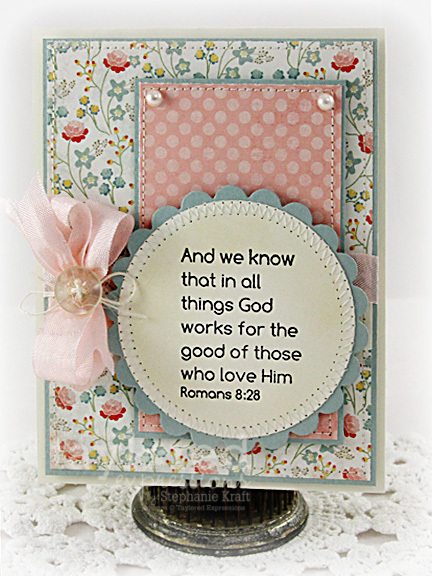 Faith in Bloom is a huge set of rubber stamps consisting of nine sentiments/verses AND nine flower images. The stamps are pre-cut and mounted and come on a full color panel (5.75" x 8.5") which store perfectly in our Mini Binder Boxes. It is an incredible value at $21.95! Now on to my projects...! The first two cards are similar (above and below). 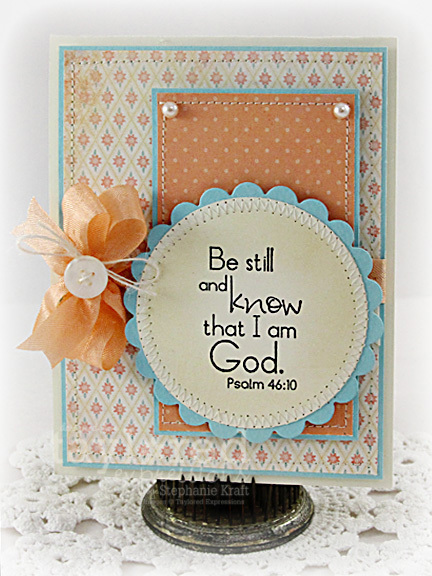 I used different patterned papers, and I did stamp a couple of the verses. I sponged a little Antique Linen Distress ink on both of the circles while they were still in the die. For the next one, I stamped one of the flowers, masked it and stamped a second one so that they are slightly overlapping. Both flowers were paper pieced and I added pearls to the center of each flower. I used the Fly Your Flag 2 Die for the sentiment above and the verse below and popped it slightly over my circular panel. 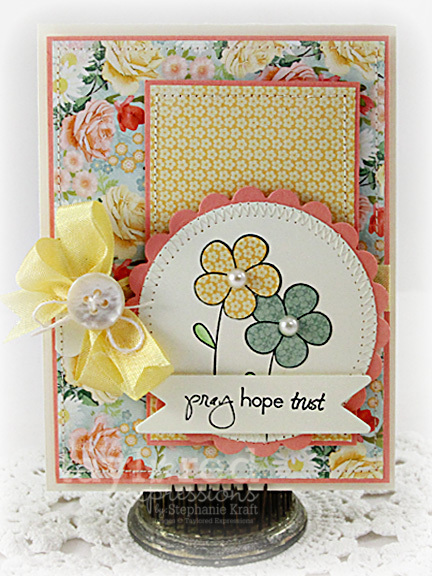 For the card below, I stamped the single flower 3 times and colored each with Copic markers. Finally, I added a pearl to the center of each flower. I also finished off each card with some stitching, seam binding, and a button tied off with twine. For sketch inspiration, I used Karen's Sweet Sunday Sketch #153. 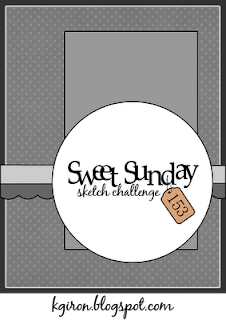 I love this sketch and it was fun to use on all of my cards! Accessories: Fly Your Flag 2 Die, Small Scallop Border Die (Taylored Expressions); Standard Circles Large and Scalloped Circles Large Nestabilities (Spellbinders); Seam binding, Buttons, Twine (May Arts), Pearls (Kaisercraft), Foam tape, Thread, Sewing machine. oh, wow! what a fabulous collection of cards you created. so pretty with those papers. such a beautiful set! love the yummy springy colors! Wowsers!! These are gorgeous!! Love all your projects this week :). These are extraordinary! I love the layout (hehe) and I really like the individual look of each card even though you used the same layout. So sweet! Stephanie these are pure delight!! I just bought this paper yesterday, oh how you've inspired me! I've long been a fan of your work at CR84FN. And I've realized I'm missing so many of your other projects...fixed that I'm your newest follower! A beautiful series of cards - all so fresh and soft. Such a pretty collection of cards Stephanie! I love both the paper pieced flowers and the ones you colored! Your fancy stitching adds the perfect touch! I think you knocked this release out of the park! What a beautiful set of cards, Steph! What a gorgeous set, Stephanie! Lovely card set, Stephanie. Thanks for sharing your amazing creations and inspiration!! Oh my goodness..these are AMAZING! Thank you, as always, for the inspiration!! !